After years of blindly following box score stats to track player performance, I have finally decided to sit down and analyze whether these salient statistics are strong indicators of a player’s contribution on the court. Today, I will focus on guards, players who are often judged by their shot efficiency, scoring prowess, and ability to make their teammates better. Conventional wisdom would suggest that there is a clear signal linking field goal percentage, points, and assists to overall player value and success throughout a season. To my surprise, this was not the case. I specifically looked at all guards in the NBA who averaged at least 20 minutes per game during the 2013 regular season, a sample size of 69 guards after filtering and massaging the data. The rationale for this step was to objectively weed out the “garbage crew,” players who coaches throw in during blowouts (think Scalabrine). After removing this obvious noise, I then created a matrix of correlations to understand the direction and strength of relationships between key stats. I first started looking for factors that were highly correlated with a guard’s average plus/minus score over the course of a season. (For those who are not familiar with this stat, it measures a team’s point differential when a given player is on the floor versus when he is not.) There is a very strong positive correlation (+0.89) between a player’s plus/minus score and his win percentage. This is a very intuitive relationship—teams with better records tend to have stronger players who play in specific rotations that can collectively influence a given player’s plus/minus score (and vice versa). A good example of a subpar player who benefits from this logic is Mario Chalmers. Mario’s stats on the whole are not very impressive, but he averaged a whopping +7.4 in the plus/minus column in 2013—it probably helped that he was playing with two future Hall of Famers in Miami. Interestingly enough, key box score items for guards do not seem to provide much signal about their overall plus/minus scores. There was almost no correlation (+0.08) between a guard’s average points per game and his plus/minus score. There was an even lower correlation with assists (+0.05) and a slight negative correlation with free throw percentage (-0.10). Steals and field goal percentage had a little more signal, providing correlations of +0.24 and +0.27, respectively. However, it appears that the conventional stats do not directly correlate to player contribution over the course of a season. 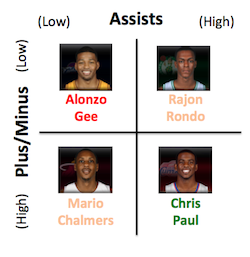 Here is an example player profile that helps provide some intuition for how plus/minus and assists are related. To my surprise, number of seasons with current team had a stronger correlation (+0.33) with plus/minus scores than any of the core box score stats, like assists. One interpretation for this could be that stars are often locked up in longer contracts, so this factor could simply be biased in favor of stronger players to begin with. Team chemistry could also be a confounding factor here, in that players who have been with their teams longer fit better into the team’s system. In addition, this factor also filters out younger players who are just starting to make their mark in the pros; number of years pro had a slightly larger correlation of (+0.34). There are some players, like Tim Duncan, whose contribution would be a combination of these hypotheses and more. In addition, average minutes played is very strongly correlated with points (+0.76), assists (+0.59), rebounds (+0.56), turnovers (+0.74), and steals (+0.46). 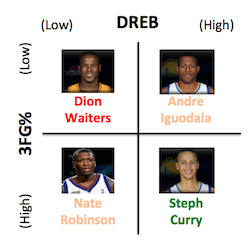 This can be rationalized in many ways, the most obvious being that stars tend to play more minutes. 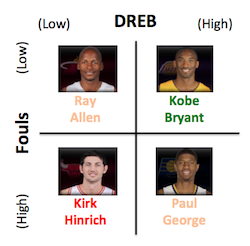 There was also a fairly strong correlation between fouls and defensive rebounds (+0.51). Since guards who come up with defensive rebounds generally need to be more aggressive around the glass, this is not a particularly staggering relationship. However, it is interesting that the correlation between fouls and offensive rebounds is significantly lower (+0.32). Either (a) the traditional statistics that the NBA uses to assess guards do not capture their true contributions to their teams or (b) guards, on average, are not the most valuable members of their team (in terms of plus/minus ratings). Given the strides that we have seen in baseball with the adoption of on-base percentage (in favor of the conventional wisdom supporting speed and contact measurements for batters), my guess is that the former is more likely. As plus/minus scores suggest, individual player stats cannot be viewed in a vacuum and are actively shaped by the teammates and environment around them. Nice analysis. Some of those correlations really surprised me. Wow–I really thought assists were the best measure of a guard’s worth. Thanks for sharing! He is not All-Star material but his +/- scores are All-Star caliber. I explain that this stat is very much influenced by the players he has around him.